More than ping-pong tables or catered lunches, millennials want to pay down their student loans. Over two-thirds of Americans graduate with student loan debt, which averaged $39,400 for those in the class of 2017. 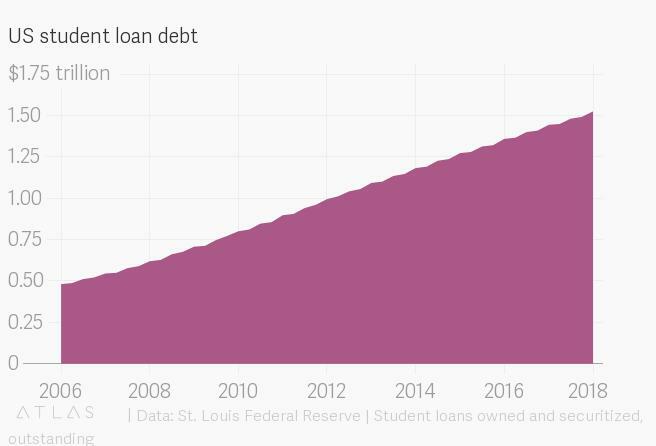 A combination of the ease of getting a loan and the skyrocketing cost of college tuition has sent student loan debt in the US to crisis levels. In a difficult hiring market, employers are beginning to see the value of alleviating that burden. A host of startups including SoFi, Goodly, Tuition.io, and Gradifi (which was acquired by First Republic Bank in late 2016) offer student-loan assistance as a workplace benefit. The average employer on the Goodly platform pays $100 toward each employee’s student loans every month. Though these benefits are generally geared toward recent college grads, a sizable chunk of student-loan debt holders are in their 30s and 40s. A study of college graduates in Wisconsin found that it takes about 20 years on average for students to fully pay off their loans. So, it’s not just millennials who are reaping the benefit of these services. A recent survey conducted by Fractl and written about in the Harvard Business Review found that student-loan assistance was not as coveted by job seekers as better medical insurance, more flexible hours, work-from-home options, or unlimited vacation. But it was prized over other kinds of perks, including tuition assistance, paid parental leave, gym memberships, or free day-care. The stress of having debt affects not only how employees view their jobs, but also what jobs they can take in the first place. Though student loan forgiveness isn’t for everyone, programs that make offices more inclusive to potential candidates from a diversity of financial backgrounds creates a better work environment for all.